Hi guys! 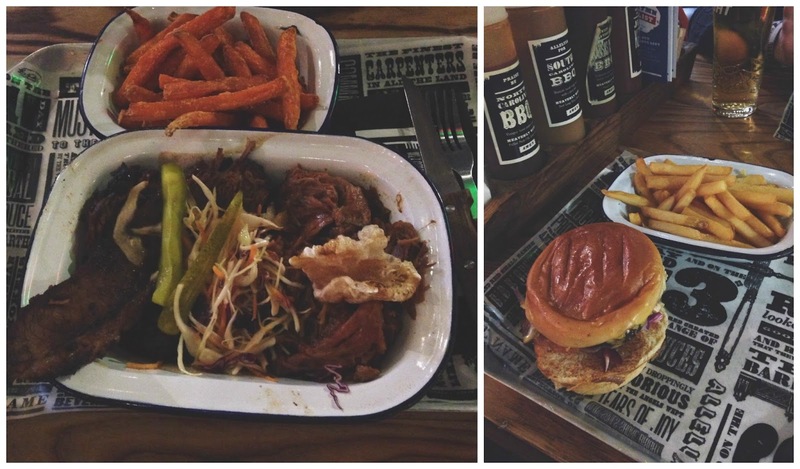 Another lifestyle post this weekend, and today I'm talking about Red's True BBQ. I heard about this place from In The Frow (I think it was from her Instagram!) and I put it straight on my list of places to visit! So, myself and my boyfriend took a trip there for lunch the other week. Firstly, it was pretty busy for a weekday lunchtime, so definitely get there early if you don't want to be waiting - it seems pretty popular! Secondly, if you're a vegetarian, I'd maybe not recommend this place, because it is based entirely around meat so I didn't spot any veggie dishes! After much deliberation - there is so much choice it was almost overwhelming! - I settled for the Bacon Cheeseburger with fries and my boyfriend opted for the Combo No.4 of pulled pork and a brisket with sweet potato fries. When it arrived on a tray with the fries in little dishes, we tucked straight in. The burger was really good, the bacon was nice and crispy and I loved the sauces they added into it. You also have the option of adding your own sauces, as they have five bottles lined up on your table with recommendations of what dishes they go best with! I tried some of the pulled pork and the brisket from my boyfriend's tray and I can confirm they were absolutely gorgeous. For someone who's not a big fan of red meat, I thought it was absolutely amazing - although I don't think I could manage that whole dish! Both the fries were really nice, although I do prefer the sweet potato ones as they were much crispier, but I added some of the BBQ sauce from the table onto my regular fries and that added a nice kick to them. 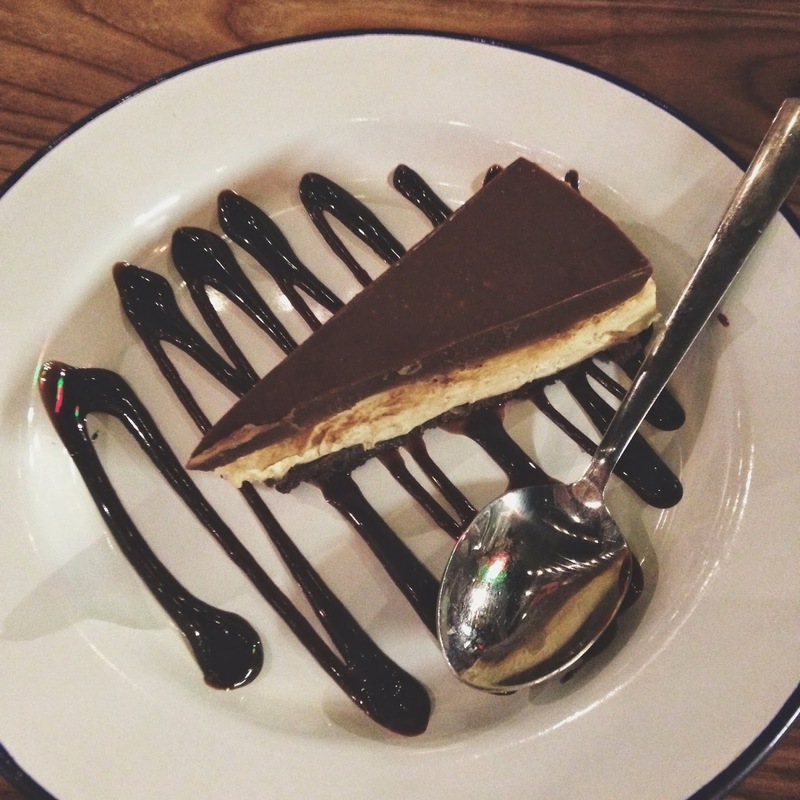 Afterwards, I still had a little bit of space left to manage something else, so I went for the Chocolate Peanut Butter Cheesecake - mainly because anything with peanut butter in is a winner in my books! It was absolutely lovely and if you still have any space after your mains, I'd definitely recommend going for this - it isn't overly peanut-ty but the rich chocolate fudge with the chocolate biscuit was amazing. It's also worth mentioning that although I didn't have a cocktail myself, the menu for them looked so good and there were lots of twists on old classics that I'd love to try out when I next get a chance! At the moment they're only based in Headingly, Leeds and Manchester but I think they are introducing new restaurants all over the UK! You can book a table on weekdays but not on weekends so I'd recommend going there on a weekday if you can. Here's their website where you can peruse the menu or make a booking.